In this video and article we take a look at the Apple iPad 6th Gen 2018 model which includes Apple pen support and upgraded CPU A10 fusion. While the Apple pen doesn’t come with the iPad you can buy it for $99 USD. This is the first time the Apple Pencil has been included on the Apple iPad 6th Gen.
To pair the Apple pencil with the iPad its very easy. Simply remove the lid on the Apple Pencil and plug it into the lighting port on the bottom of the iPad. You should then see a message come up on the iPad telling you that the iPad is pairing with the Apple Pencil. However the Gold colour iPad has been replaced with a kind of pinkish gold now. Its still called gold but the new gold is a warmer colour now. The Pencil is great but it doesn’t work so well as a general navigation tool. So to get the most out of the Pen you will need to find applications that support it. In the video I use the Apple notes application and it works quite well. The battery is a 32.4 watt hour battery and according to Apple you should get around 10 hours of battery life. Using the iPad is still the same as pervious versions. Swiping down brings you to the search menu. Swiping down from the top of the iPad will give you your notification’s menu. Swiping across will give you your widgets menu. Swipe up from the bottom will give you your recent apps menu along with the control centre. Hi guys and welcome to 123 my IT’s video on Apple’s latest iPhone release the Apple iPhone 7 Plus Product Red. the first thing that you will notice about Apples new iPhone is that it’s red and you can get this model in both the iPhone 7 and iPhone 7 Plus. These phones come with 2 storage options 128 gigabyte and a 256 gigabyte capacity. Apple very conveniently have released this new colour on the very same week that Samsung Galaxy S8 is due to be announced. This iPhone is called the Product Red iPhone because it’s part of the Product Red cause which means that a portion of the profit from the sale of this iPhone goes to the Product Red cause. And you can find out more about this on the link below. As you take the iPhone out of the box the first thing that you will notice is the back of the phone is red however the front of the phone is white. This has been a big disappointment for myself and also a lot of other iPhone fans, because a lot of people would have liked to have seen a black front on the iPhone with a red back or a fully red iPhone both on the front and back. This aside the quality of the iPhone and the deepness and sharpness of the red his outstanding. Is it worth upgrading to well I’m not convinced unless however if you are in the market for a new iPhone then this would be an ideal selection. This is the matte finish very similar to the other iPhones, however this is not like the Jet Black model which had a glossy finish. So it should be fairly durable. One nice thing that Apple has done here is they have match the antenna lines with the bezel of the phone so the antenna lines are almost hidden. So what do you think guys do you think the iPhone read is worth the upgrade? leave your comments in the comments field below and thanks for watching. This video will show you the Apple iPhone 7 Plus in Black Unboxing & Firstlook. The Apple iPhone 7 plus and the iPhone 7 comes in two different sizes, the iPhone 7 and the iPhone 7 Plus and basically they have the dimensions as the iPhone 6S and the iPhone 6S plus. However the iPhone 7 is still worthy of an upgrade as it comes with the host of new features such as waterproofing along with dual cameras on the front and back. 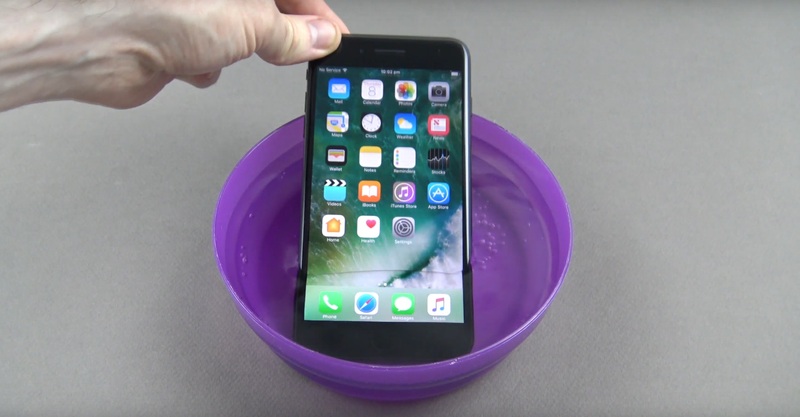 The iPhone 7 has a IP76 certification which means the phone is actually waterproof then you can actually put it into a 1 metre of water for up to 30 minutes in terms of screen size the iPhone 7 and 7 Plus are exactly the same as the iPhone 6S and 6S plus so no real changes there. Another big change with the iPhone 7 over the predecessor iPhone 6S is the integration of these antenna lines around the phone so the good thing about getting either the black iPhone 7 models if you can’t really notice the antenna line that goes around the iPhone and apple have been able to integrate the antenna line a lot better than they did with previous models. If we take a look at the bottom of the phone here it looks like we have stereo speakers but in actual fact one of the lines he is a speaker and the other is a microphone line Apple wanted to make it look very nice by having the same amount of lines on both sides. Another thing to mention here is the removal of the headphone audio jack so now we just have one lightning USB port on the bottom. On the top of the phone beside the earpiece that you can see we now have a 7 megapixel FaceTime HD camera with F 2.2 aperture and this camera can record at 1080p HD video. On the back of the iPhone 7 we’ve got a 12 megapixel camera with optical stabilization and F 1.8 aperture now beside the main camera sensor with a second sensor which is a 12 megapixel sensor just like the other one however it’s got out 2.8 aperture which allows you to zoom in on images now beside the dual cameras we have a microphone plus we have a quad LED flash which is 50% brighter and can shoot 50% further. So would I recommend the iPhone 7? I would say yes for sure I’m not really an iPhone fan but just the general quality of the build of the phone, it’s really nice, the phone fits really well in the hand the rounded edges feel really nice and comfortable it doesn’t feel like it’s going to slip out of your hand when you’re using it. Apple have done a really good job getting the screen to attach to the bezel there. If I had to say anything negative about it is probably just the length of time that it took me to get this this actual model so the iPhone 7 Plus so I hope I pre-ordered back in September and it’s only just arrived now and it’s now December so it took a long time to get here and part of the delay for these iPhones here in Australia was that these Black covers a really hard to manufacture and apparently they had something like a 40% failure rate with the quality of these black covers on the iPhone 7 and that’s why I’d actually take such a long time to work to get one of these models here in Australia. This video will show you the Asus GL702V Strix Unboxing & Benchmark. This laptop is a ultra mobile gaming laptop. The Asus GL702V Strix gaming laptop has the latest 6th gen Intel processor and NVidia GTX graphics in a Compact lightweight design. With a profile measuring just 24.7 millimetres and the whole laptop when only 2.7 kilograms the Strix GL702V is an ultra portable gaming laptop. In fact it was so light I thought I had been sent the wrong laptop when I picked it up from the post office. The strix is VR ready with a GTX 1060 GPU which provides enough speed to power virtual reality gaming. The Strix comes in two different sizes 15 and 17 inch and with many different GPU and CPU configurations. Capacity: 256GB SSD I installed this.